So college is supposed to be the best time of your life right? In many respects it is, but this would not be a blog about college without mentioning student debt. This video seems to really show students how they can build up debt so fast. Some of the students in the video seem oblivious as to how much they’re spending, and don’t really think about how they are going to pay all that debt off. Sure there are many sob stories, but what is the reality? The reality is COLLEGE IS EXPENSIVE. While the girl in the video might have been oblivious to her accumulated student debt, I have been paying close attention. Ever since I started the college application process, student debt has been something that has really loomed over my mind. Since I do plan on continuing my education after college, I don’t really want to accumulate a ton of debt as an undergraduate. So what type of loans are there? Well there are always the federal loans, Direct Stafford Loans. They come in two basic types, subsidized and unsubsidized. subsidized loans are only for students with financial need, so if you qualify for subsidized loans, you’re lucky. Subsidized loans don’t charge interest while you’re in school, but unsubsidized loans do (usually 6.8%). Unsubsidized loans are mainly for students who do not demonstrate financial need, but still can’t afford the price of tuition. If all these loans still don’t meet the cost of tuition, there are always private loans. These all sound like nice ideas…so where’s the trap? Well the trap is in the interest. In the beginning, the interest payments don’t seem so bad. 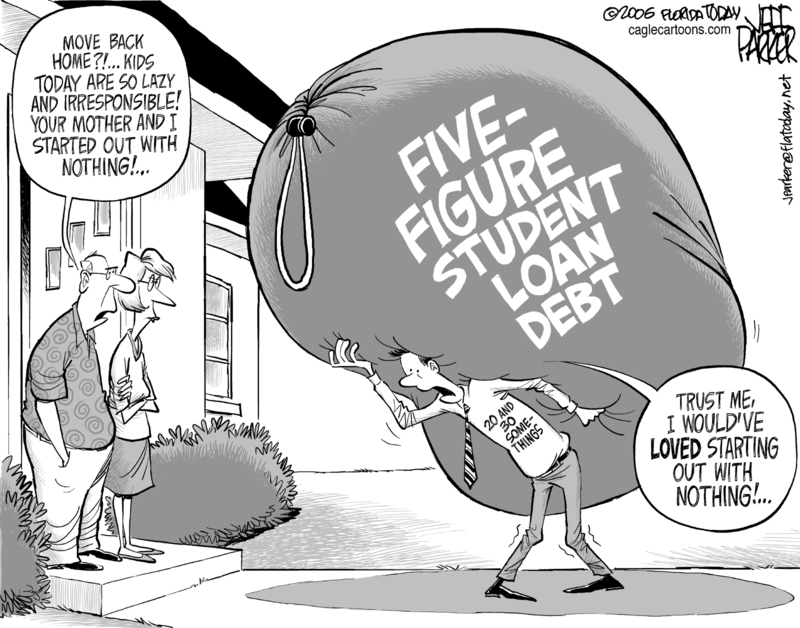 Let’s say a student borrows $5,000 of unsubsidized loans (6.8% interest) for freshmen year. That means at the end of the year they should expect to pay $340 in interest on that loan, but they don’t pay it since it’s only freshmen year. Doesn’t seem too bad yet? Well that was one year. The next year, this student decides to borrow another $5,000. So then that student is expected to pay $340 interest for the new loan plus another interest on the other $5340 from freshmen year. In total, the student already has an extra $1043 in just interest alone for 2 years in college. Keep in mind that college is usually a 4 year process, and there are all sorts of different loans on top of unsubsidized loans. After the 4 years, you will also be expected to pay the subsidized loans back. This is how student debt adds up. There is, however, way to avoid paying interest on top of interest though, and that is by paying just the interest every year so it doesn’t accumulate. If you can’t afford or don’t want to pay the interest off every year, then your interest will just accumulate every year. Everyone wants to go to their dream college, but one should also keep in mind financial aid. If your dream college is going to require $100,000 in student loans, then you should probably ask yourself if this is your only dream college. Just like books, you shouldn’t judge a college by its cover. Some colleges seem to have a hefty price tag such as Stanford, but after financial aid, some students will find themselves paying less than they would at a UC simply because private schools have better non-need based aid and merit scholarships. My advice, apply to a fair amount colleges you want to attend without looking at the price tag. Only after you get accepted, should you look at the amount of aid each college is willing to provide. Sometimes you will be surprised! This entry was posted in Uncategorized and tagged college, financial aid, higher education, loans, student debt. Bookmark the permalink. Good suggestion to just apply to the colleges you want and wait for the financial package to arrived. It really helps. Yes exactly! Colleges are very unpredictable so sometimes your top choice won’t give you the type of financial aid package that you want. It’s nice to have a couple back ups that are willing to help you out throughout college so you’ll come out with as little student loans as possible. Thanks for reading my post!